Webinars can be an amazing source of leads for businesses. The way they work is quite simple: you offer lots of value and the leads will come to get that value. 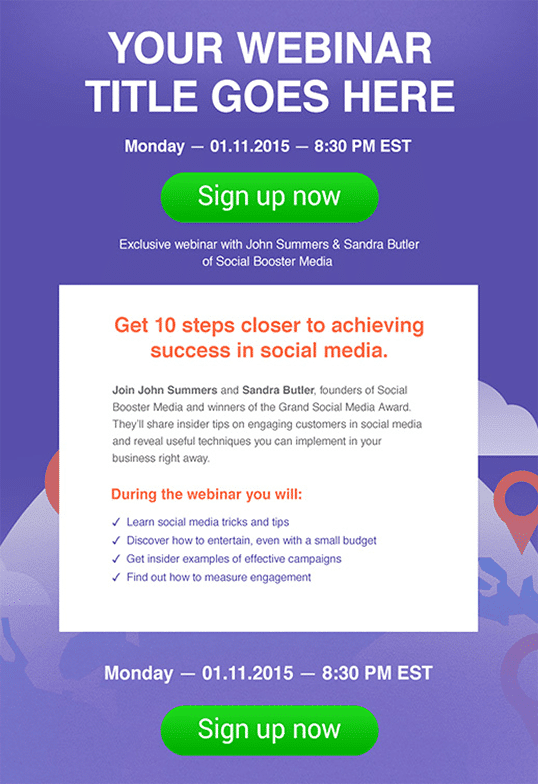 But, how do you create a winning webinar? How do you make sure that your time is not wasted and you’ll have plenty of viewers and as many leads as possible? 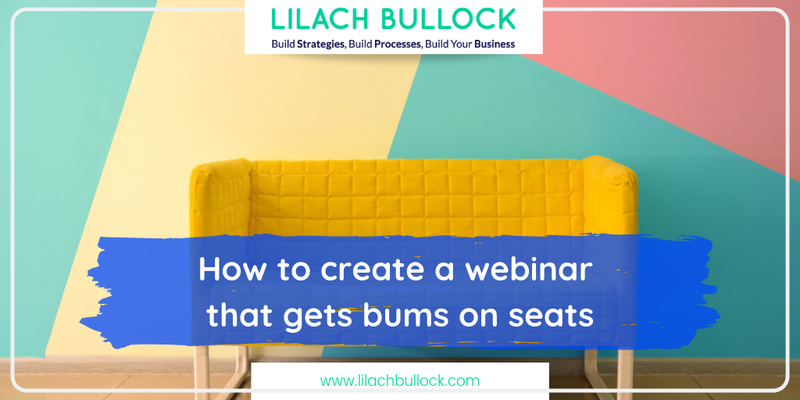 In this blog post, I’m going to show you exactly how to create a webinar that gets bums on seats. I’ve done quite a few different webinars over the years; some produced solely by me, some in partnership with other enterprises, but whatever the case, I’ve learned a lot about what makes a webinar successful. Not only that, but also how to promote it to get as many people as possible attending – and in this guide, I want to share all of this knowledge with you: how to come up with a good idea for a webinar, how to select the right headline, how to record your webinar, how to promote it, and basically everything you need to know to create a webinar that gets bums on seats. Who should hold a webinar? 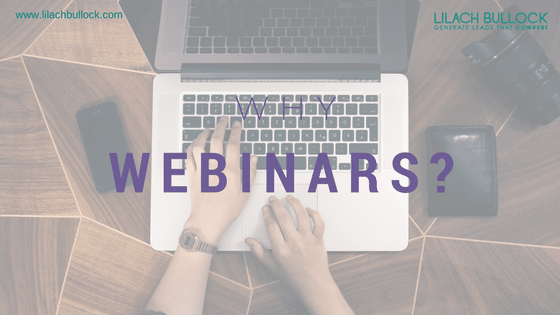 Webinars work across industries and businesses; however, that doesn’t mean they are necessarily suited to anyone and any business. The truth is, they tend to work better with B2B companies, but that’s not to say that they can’t work for B2C, as well. In my opinion, so long as you can use a webinar to offer value to your target audience, then it’s a viable marketing tactic. People online get hit by content and information from all sides, so if you can offer something better than the norm, something that offers them real value, then it’s definitely worth exploring. 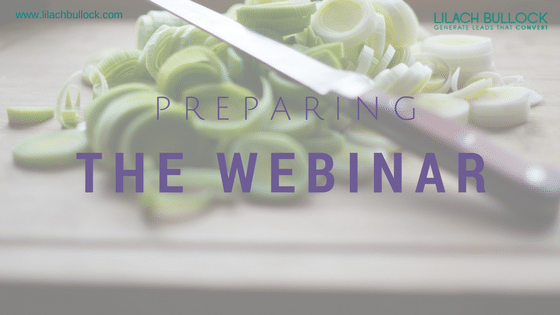 B2B companies, coaches, mentors and other professional service providers, as well as some B2C companies, can all benefit from hosting webinars. So, you’ve decided to create a webinar. My question to you is, what is your goal with this webinar? This is important to establish from the get-go – before you start thinking of topics, headlines, and definitely before preparing any materials to record your webinar. The reason why is because once you know what you’re trying to achieve, it will allow you to come up with a webinar topic/idea that will support this goal and help you achieve it. Once you know what your goal is, it will be easier to create a webinar that supports this goal. If you want to sell more of a particular product or service, then that’s what you’d focus on. If you want to raise brand awareness and advertise your business, a subject with a wide appeal might work best. Or, if you’re looking to convert more of your leads, then you’d need to pick a subject that interests these leads and subtly show them why they would benefit from getting your product or service. Once you’ve established what you want to achieve through your webinar, it’s also important to set goals for the actual webinar. For example, how many people you want to register to attend your webinar, the attendance rate, and so on. By doing this, you’ll have clear goals to focus on once you start promoting your webinar, and it will also help you with future webinars, as you learn from your previous webinars’ mistakes and wins. Set goals that are realistic and attainable and don’t forget to make sure that they’re actually quantifiable – no sense in measuring something that can’t actually be measured. Your goals can be anything from how many people register and how many actually attend to how many converted and how many leads you managed to generate. Once your webinar is over, make sure to measure all of these results to see whether you’ve achieved your goal or not – but, more on that a little later, after we actually go through creating a webinar. Your webinar – evergreen or closing date? One of the decisions you need to take regarding your webinar is whether you want to keep it open (evergreen) and let people keep watching it, or if you only want to keep it available until a certain date. Generally, it’s a better idea for your webinar to be evergreen; this way, you can continue driving leads and conversions from your webinar, with less effort on your part. 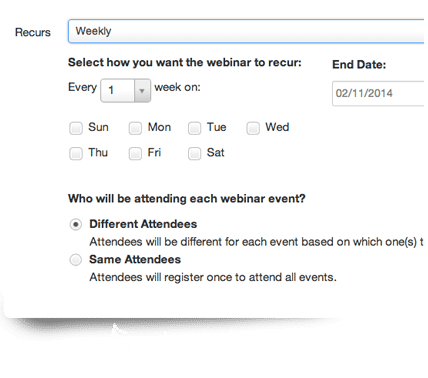 Alternatively, you can set up clear starting and ending dates for your webinar. The benefit of creating a webinar this way is that it’s a bit easier to gather attendees for it, for the simple reason that it’s easier to create urgency in these cases – and sometimes, urgency is the deciding factor for people. However, it’s completely up to you which route you choose; consider who forms your audience, your webinar goals, and so on to make your decision. Webinar: one episode or a whole series? Another decision that you need to make is whether you’re holding a one-off episode, or creating an entire series of webinar episodes to cover the same main subject. There’s really no right answer here; it all depends on your resources and your goals. If you create a series, for example, you might get fewer people attending, but you’re also offering more value, which will likely translate into more leads. But, at the same time, it’s also a lot more work; do you realistically have the time to create, promote, and hold so many different webinars? Is there enough interest in multiple ‘episodes’? You’ll need to make this decision in order to help you figure out what your webinar should be on. Now, time for a big question: what should your webinar be about? What topics should you cover? What will be the format? First, as I mentioned earlier, you should consider your goals. If you want to increase brand awareness, then perhaps it’s best to set up a Q&A with a recognizable name from your niche. Or, if you’re looking to convert more people, you could offer a free educational webinar about one of your products/services. Your most popular blog posts: what are your top posts? This way, you can get a better idea of what interests your particular audience, and what they want to learn more about. Perhaps you can expand on one of your popular blog posts, or maybe focus on new developments – your blog can be a great source of ideas, so go through your blog posts carefully. Comments: what does your audience like talking about? What do they ask you about in comments on your blog, in their emails back to you, on social media? If you’ve noticed several people are asking the same question – then perhaps right there is your answer to what your webinar should be about. See what other blog posts are popular in your niche: don’t just look at your own blog, but others’ as well. What are the most popular, most read, and most shared articles? What can you learn from them about your audience – and how can you use them as a basis for a webinar? Talk to your clients: you could also ask your clients, point blank, what they want to learn more about; or, even better, what they struggle with the most. Chances are, they’re not the only ones struggling – these are your potential leads. Your past experiences: if you work with clients on a regular basis, then you likely already have a feel for the struggles they face. Consider the people you’ve met and worked with, the conversations you’ve had – what were their biggest struggles, their most frequently asked questions? Create a survey: another way to get ideas for topics? Quite simply, ask for it; you can easily create a survey for free with services like Survey Monkey and ask people on your social media profiles, or in your list, about what they’d be interested in learning more about. Whatever topic you choose, spend some time afterwards to write down all the benefits of attending this webinar. What will people learn? Where is the value – and is it enough? Why would people want to attend your webinar? What problem are you solving? Your best bet: focus on a single problem to solve. Be honest with yourself, and put them down in writing – it’ll help you later on, as well, when you start promoting your webinar. The headline you choose is of the utmost importance; it’s one of the first things that attracts peoples’ attention and that starts the decision-making process. Because a webinar is a bit more work for the attendee than, say, reading a blog post, they’re going to do a lot more research before diving in (into who you are, the exact points covered in the webinar, who’s invited, and so on) so the headline is not all-important – it’s just very important. Ha! That said, you shouldn’t overlook its importance; as I mentioned earlier, it’s one of the first things that will attract (or not attract, as the case may be) your audiences’ attention, so unless the headline works, then they probably won’t get to the other investigative steps (who you are, what the webinar will cover, etc.). So, what makes a good headline for a webinar? First things first, it needs to be clear – as clear as the Indian ocean in the Maldives (whatever you do, don’t search for images – you’ll forget all about the webinar you’re planning). Once someone reads the headline, they need to be very clear on what it will be about: what they will learn and how it will benefit them. Because attendees will be investing quite a bit of their time to take part in your webinar, it’s a good idea to explain the benefits in your headline – people want value, they want it quickly, and if you can’t promise that value, they’ll move on pretty quickly. Generally, though, how-to type headlines work very, very well with webinars. But, instead of focusing on “how to <do something>”, focus rather on “how to <improve something> by <doing>”. To give you an example, instead of something like “how to manage your Twitter like a pro”, turn it into a benefit, like “How to spend less than 15 minutes a day and grow your Twitter”. As you can see, there’s a much bigger focus on the benefits with the second headline – and that’s what ultimately gets people interested. If you haven’t already, make sure to check my ultimate guide to writing more effective headlines, here, as there are a lot more examples, tips, and particularly, headline examples and templates. Your webinar can either be live, or it can be recorded ahead of time. Personally, I prefer recording them ahead of time, so as to make sure everything goes smoothly and that I’ve definitely covered everything that needed covering. Introduction: explain who you are and what makes you qualified to hold this webinar and start interacting with your attendees; if there are any other participants (Q&As, case studies, etc.) take the time now to properly introduce them. You should also ask them to close their phones, take out a pen and paper and let them know there will be a Q&A session at the end, so they should jot down any questions they might have over the course of the webinar. The agenda: what is the webinar about and what will you be covering, step by step? Apart from recording the webinar, there are also other materials to be considered; can you offer attendees any useful resources? These, of course, will need to be prepared ahead of time, whether your webinar is live or not. The materials you can/should create will solely depend on what your webinar is about, so it’s difficult to give exact examples. For example, if we were using the same example as before, on Twitter marketing, then you could offer a Twitter marketing checklist, an editorial calendar, tweet templates, and so on. Basically, anything that can aid them in getting more results from attending your webinar. Whatever can help your attendees and you can offer – offer it to them. For one, the headline needs to be very clearly visible – the main thing, apart from the call to action button, that your visitors can see immediately. Then, write a short summary of what your webinar is about. Under that, write the list of benefits of attending the webinar, using bullet points, as that makes it easier to read. You should also leave space to talk about the hosts and include images of them as well. Then, either on the left-hand side or the right-hand side, use the space to add your form and the call to action for attending the webinar. You shouldn’t ask for too much, or it might put people off; however, on the other hand, if you don’t have enough fields, then you might get a lot of people registering that aren’t really that serious about it (and will likely not attend). The call to action button is another very important element of your landing page and you should, ideally, a/b test different colours, shapes and wordings. To help you create a landing page, check out my list of 10 best landing page builders here. 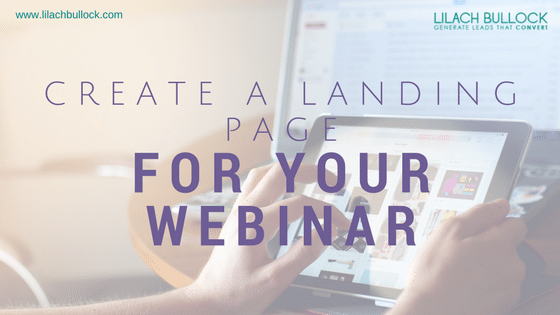 Once your landing page is ready and you’ve set a date for your webinar, you have all you need to start promoting it – the sooner you get started, the better. Ideally, you should create a promotional plan that you can follow – it’s an easier way of making sure you leverage each and every possibility. Write a blog post about the webinar: present the issue you’re going to cover and talk about what the webinar will be about, what the benefits of attending are, who will be taking part, and so on. Basically, a landing page with a lot more detail – and don’t forget to either link to the webinar landing page, or to include another opt-in form where your readers can easily register. Then, there’s your email list – this is a great resource, particularly if you’re looking to convert more of your existing leads. Send them an email invitation to the webinar, a few weeks before the webinar is to take place (at least 2 weeks in advance). You should also start promoting the webinar on your social profiles, at least a few weeks before the event – the sooner you start promoting it, the better. 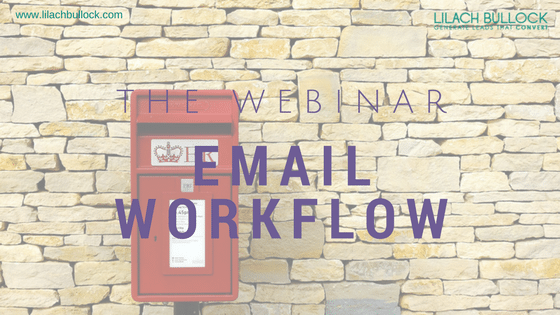 Email 4 – a couple of days after the webinar: after the webinar is over, it’s important to touch base. There are 2 scenarios here: either they took part, or they didn’t and in any case, you should email both groups at this stage. For those who took part in the webinar, thank them for attending, ask them nicely to share if they found the webinar useful and let them know they can set up a call or meeting with you if they’re interested in finding out more. You could also take the opportunity to ask them a few questions about what they fought of the webinar – this will then help you improve future webinars. With those who didn’t take part in the webinar, tell them what they missed and, most importantly, that they can still view the webinar if they want to (unless, of course, it’s a one-off thing). To set up this automation, you can use most major email marketing tools – or check out my list of top marketing automation tools here. Use this information to improve future webinars; what more can you do to improve registrations and attendance? Your landing page? How can you generate more leads and more conversions? What are the best places to promote your webinar? 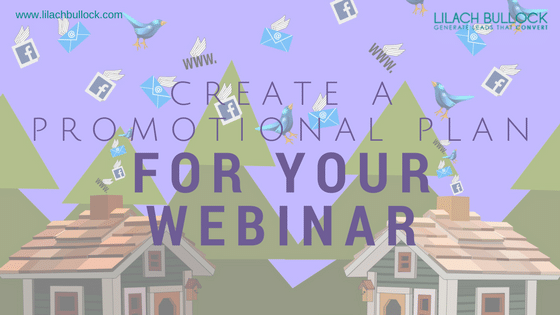 You’ve spent a lot of time and effort into creating your webinar, so there’s no point in using it once and forgetting about it. The first option is, of course, to keep it going – if it continues to be relevant. Even if you’re considering to terminate it completely, you should still leave a set period of time where those who registered but didn’t attend, can still view it – but make sure to email them about it. Cut out tiny videos and share them: are there any highlights in your webinar that you can cut and turn into a short video? You can then share them on social media and your blog, and generate engagement and leads. GetResponse is an all-in-one marketing platform with features for creating landing pages, for managing your email marketing and for automating your marketing tasks; and as a plus, they also offer a webinar tool. 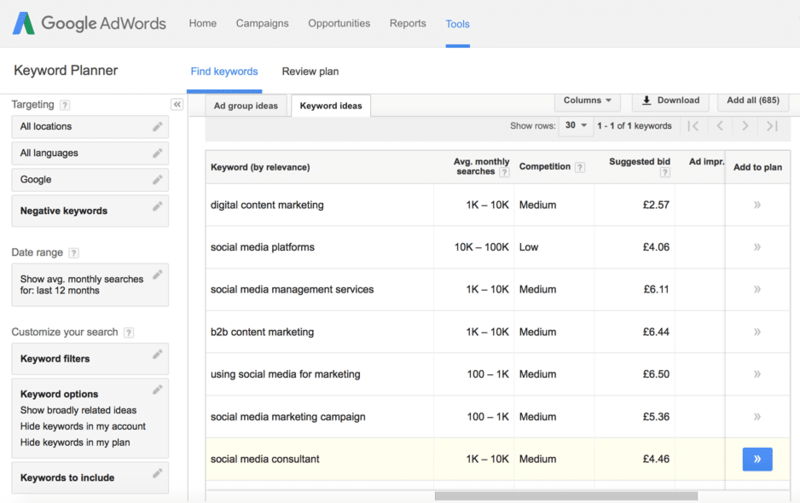 There are numerous other useful little features, such as YouTube integrations, interaction and engagement features like polls, a chat and whiteboards, social sharing buttons and much more. And, once the webinar is done, you can easily add the participants to your drip campaign so that you can send them automatic follow-ups and start nurturing them and turning them into paying customers. You’ll also have access immediately to your webinar analytics so that you can work on improving and optimising future webinar projects and to find out how many conversions you’ve made. AnyMeeting is an online meeting and webinar tool – but, obviously, we’ll focus on the webinar features at the moment. AnyMeeting can be connected to multiple different tools, such as for email marketing, marketing automation and for customer relationship management so that you can easily send invites and get people to register to your webinar. 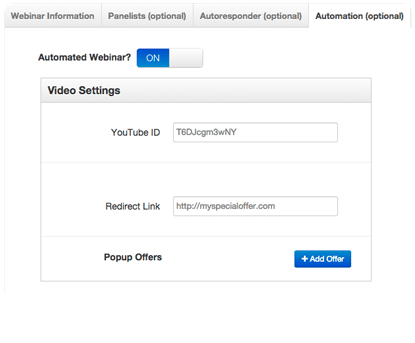 You can also integrate it with Facebook and Twitter so that you can automatically promote your webinar and send any announcements and updates. They allow as many as 6 different presenters at the same time and you can create real-time polls (or ahead of time!) and use their Q&A tools to easily manage your audiences’ questions. Webinars on Air is a tool that attempts to provide you with all the tools you need in order to create a successful webinar, in as little time as possible. For example, you can record your webinar and then automate it – even better, you can join in later on when it’s time for the Q&A session so that while you’re saving time recording your webinar ahead of time, you’re still there to respond to any audience questions. 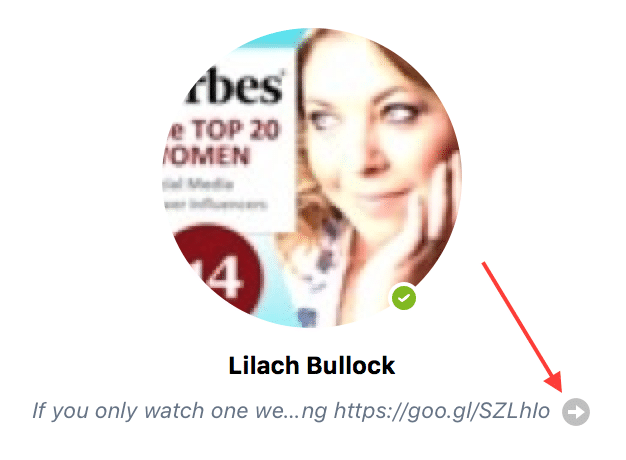 Another cool feature is the ‘one-click webinar registration’ option, where you can send emails with a one-click link so that anyone who clicks on it is automatically registered to your webinar. For those who want to use their webinar to advertise an offer or to capture more leads, with Webinar on Air, you can create an offer to share with your attendees whenever you are ready for it, and your audience will be able to buy from you without leaving the webinar room. Other features include polls, Q&A options and the ability to embed registration forms. The tool integrates with multiple others, including GetResponse, Aweber, iContact and MailChimp. 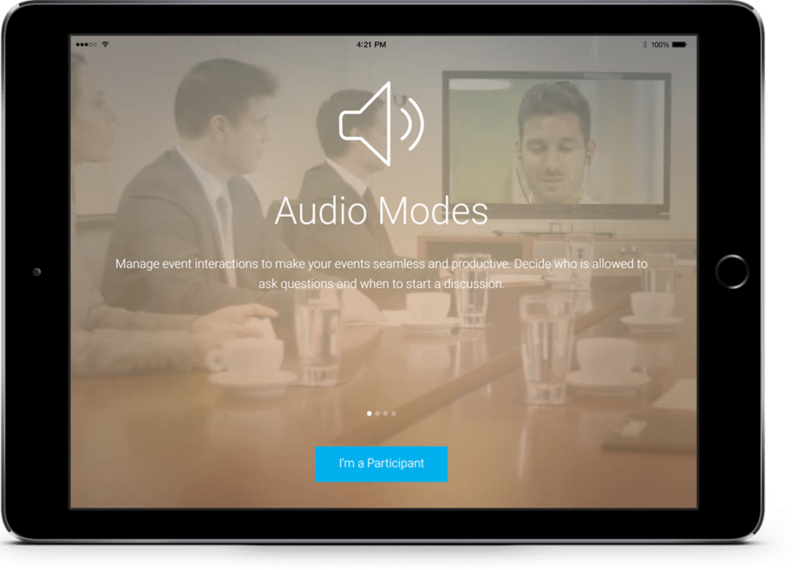 Go to Webinar (or Go to Meeting) from Citrix is another online meeting and webinar tool, designed with businesses in mind. 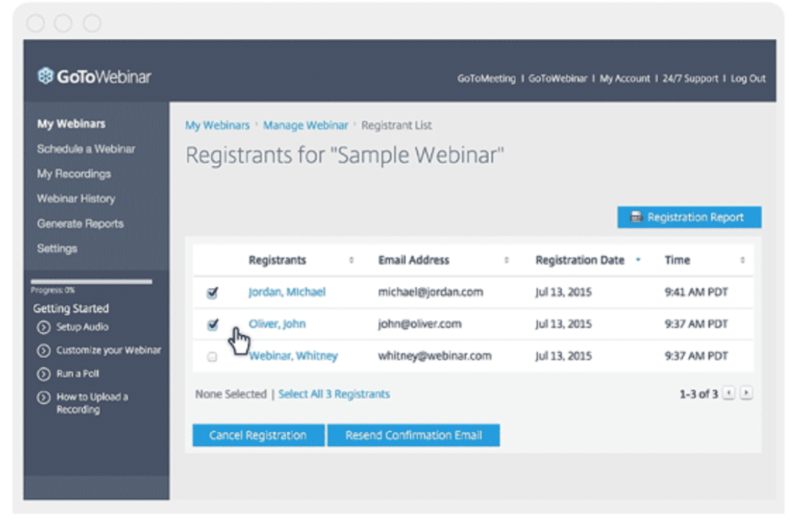 With GoToWebinar, you can create and send email invitations, as well as confirmations and reminders, or, you have the option to let GoToWebinar send their automated email templates. You can easily record your webinar and even set up practice sessions so that you can make sure you’re ready for anything. Custom branding is allowed as well, so you can add your logo as well as any other branding visuals to your webinar and any other materials. 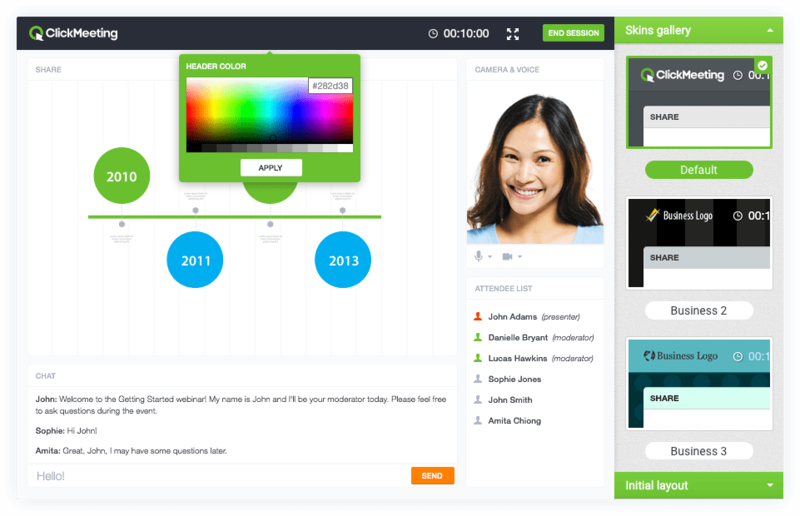 GoToMeeting allows you to create up to 20 different polls, and add up to 20 questions to your audience surveys. Once the webinar is finished, you’ll have access to excessive reporting and you can integrate with your CRM tool to easily manage any captured leads. WebinarJam is a tool designed to help you run the perfect live webinar event. 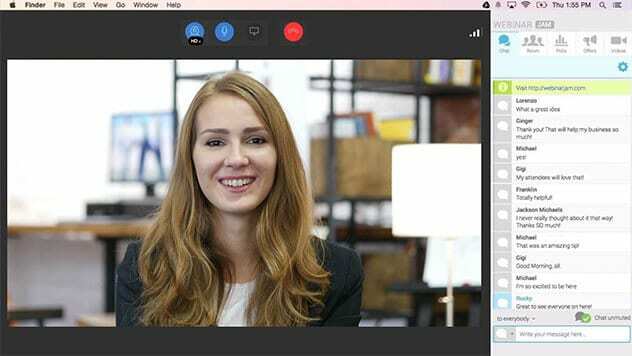 You can control the look of your webinar depending on the number of presenters – the tool allows up to 6 different presenters at the same time, or, alternatively, you can simply share your screen. WebinarJam has added a plethora of useful features in recent months, including a page builder for registration, thank you pages and so on, more templates and integrations with tools like Zapier and SalesForce. You can use Stealth Seminar to run live events as well as automated events, and even hybrid automated and live events, which you won’t find with most other similar tools. Hybrid events are basically a mix of both automated and live content. For example, one of the ways that you can use this feature is to create the actual webinar, and then to jump in live so that you can answer any audience questions. Stealth Seminar also integrates with basically all CRM tools and autoresponders, including MailChimp, Constant Contact and WordPress. BigMarker is a platform created for the ‘modern webinar’ available on web, iOS and Android. It can be used to hold webinars, meetings, online classes and web summits or conferences. 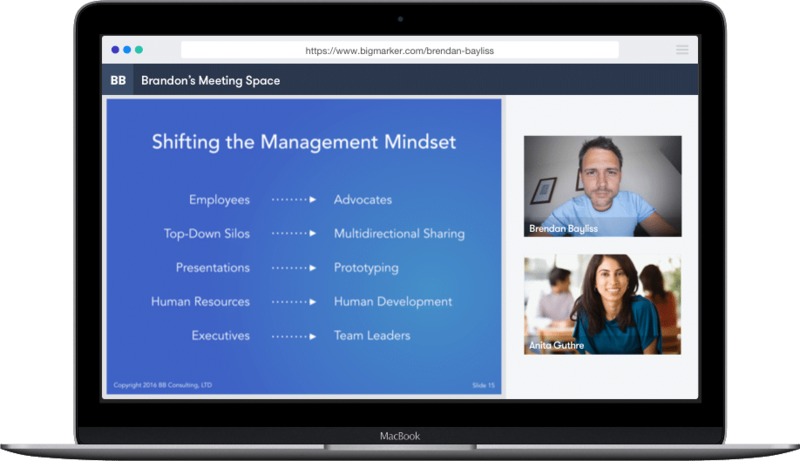 The tool is designed to hold webinars that are as interactive as possible, with screen sharing, videos, polls and Q&A features. You can also create and add custom registration forms, and integrate the tool with over 500 different tools and apps, such as MailChimp and SalesForce. ClickMeeting offer webinar tools for every stage of the process: from planning your webinar, to hosting it and to analyse stats post-webinar. Setting up a webinar with ClickMeeting is very easy to do and only takes minutes. As a plus, you can rebrand your webinar as you please, so that it stays consistent with your overall branding. They also offer screen sharing options, polls and surveys, private chats and a plethora of other useful features. ReadyTalk offer tools for creating online meetings for up to 100 participants, webinars for up to up to 3000 attendees and if you have more than 3000, you also have the option to create a webcast. 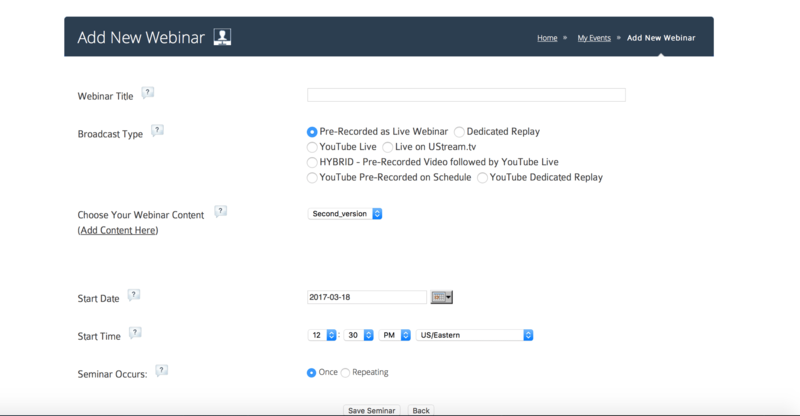 You can use ReadyTalk for webinars to manage your webinars, engage with attendees and after the webinar, measure your results. Just like most other tools in this list, you can add polls and surveys, share your screen and integrate with a variety of tools, from social networks to CRM tools. 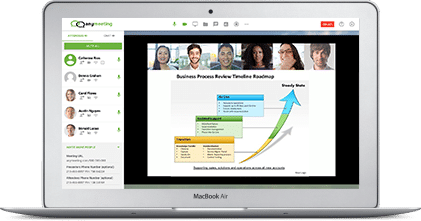 Cisco Webex is a tool for creating online meetings, webinars and online training courses. You can create webinars for groups of 100 to 3000 participants and you can make as interactive as you want; share your screen, add a Q&A section, create a poll and chat with the attendees in real time. Webex also allows you to add your own branding to your webinars. A good webinar can be an amazing source of awareness, quality leads, and conversions – when done right. It there’s one thing that you should get out of this guide, is the importance of offering real value: focus on solving one problem that your audience has and use the webinar to guide them through it. This is definitely a complete guide on how to create a webinar that actually attracts people. Understanding the goal is the first thing that a host should do and plan.